More than a thousand Shia Muslims gathered in Washington DC on Sunday in a multicultural show of anti-ISIS demonstrations. The protesters marched from DuPont Circle to the White House chanting slogans denouncing the terror group, while volunteers distributed coffee and donuts to passers-by. Adil Rizvi, the main protest organizer, said "The first step to stopping ISIS is for us to denounce them and show the world they are not a part of our community." Another organizer Dr. Azmat Husain said "We are all victims of ISIS, every American and every Muslim, and we cannot let anything divide the close bonds of friendship and community the American Muslim community has developed with our neighbors." The demonstrators wore all black, a cultural display of mourning for both the victims of recent terror attacks, but also for Imam Husain, an important historical leader for Shiite Muslims. Imam Husain, the grandson of Prophet Muhammad, was brutally attacked killed when he advocated for the restoration Islam to its peaceful and spiritual roots, contrary to the violence and corruption endemic to the ruler of his time. Shiites believe the ideological inspiration for ISIS and other radical terror groups came from the killing of Imam Husain. 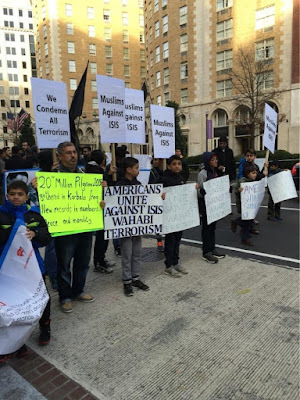 Many onlookers noted that children as young as ten were carrying posters that read "Muslims against ISIS" and "American Shia Muslims stand with the victims of San Bernardino." Hijab clad women greeted viewers of the protest with dialogue about American Muslim antipathy towards ISIS and corrupt governments such as Saudi Arabia. The responses were overwhelmingly in support of the Shia Muslim group, with many spectators visibly moved by the rally. Several individuals embraced rally goers as they walked through the city. "Just caught this peaceful march on my way to the gym. Made me nearly tear up because it was beautiful and also because it should not have to be a thing," said one onlooker.